Shogo and his party have joined up with a large group of adventurers to take down the dragon that’s been terrorising the neighbouring town and killing innocent people. With his newly discovered ability, he hopes he has enough up his sleeve to help bring the beast down, but who will ultimately survive the encounter? And if they do win, will the rewards be enough to fund his main quest – finding the mysterious spell ‘Raise’ so he can bring back what he has lost? When changing video game material into other mediums, such as films and books, there’s a lot of what makes video games unique that is lost in the adaptation. Storytelling, world building and character development are included but the main drawback is that you take away the interactive element. In most video games, YOU – the player – are the hero, the one saving the day, calling the shots, asking questions to NPCs, solving puzzles to proceed, etc. But on other platforms you’re merely an observer and the impact of being directly in control of the story is lost. Also, actions that seem natural in gameplay can come across as incredibly odd when transferred to a non-interactive medium. It’s natural in RPGs to sacrifice turns for healing the party or have a character cast Buff/Debuff spells to help turn the tide of battle in your favour. But if (for example) this happens in a movie, having the heroes suddenly stop all the action to just stand there and brace for something we’ve yet to see coming, or randomly heal people with no context of HP bars and such, it soon becomes tedious. This situation crops up in Volume 2 Final Fantasy: Lost Stranger, where Shogo suddenly realises that the dragon is a version he’s faced before in an older Final Fantasy game, and a specific pattern of attack must happen to survive. Despite the limitations of a manga, it’s surprising how effectively the writer managed to keep the engagement of battle mechanics going in a non-interactive format. Mostly because the tension, which was built from Volume 1 and continues here, is constantly escalating throughout the battle. The dragon they face is formidable, and the very real risk of death hangs over the hero and the entire party, so you know that one false move will be the end for our heroes. The art also plays a great part in it too with really detailed environments as the battle take place high on a snowy mountain, and the circumstances the party must battle in are dangerous by themselves even without a terrifying dragon lurking around. It’s a satisfying conclusion to the mini-arc and gives a big boost for the heroes as they progress with the main story. That is until something else gets in their way. Whilst the party try to obtain the spell ‘Raise’, there’s a greater threat brewing in the city of Mysidia: a conflict of magical groups that our party get caught up in towards the end of the book. Whilst the introduction of this new conflict seems to have little to do with the current plot (for now) it does allow for a few Final Fantasy Easter eggs that many long-time fans will get a kick out of. However, there’s one particular character introduced in this volume that sadly strikes an unnecessarily negative point against this book. We’re introduced to three sisters, with the eldest being Cindy who has the most ridiculous rack in all of Final Fantasy. Granted, the franchise is not shy of having curvaceous women, some of them being from the main games and are beloved characters (myself being a fan as well). However for the majority, their designs work within the contexts of their world, their characters are rounded enough to be far more than just their physical assets, and even then there’s no female with as large a cleavage as this girl has. Cindy looks like the daughter of Chiharu from Eiken who stole outfits from the models of Victoria’s Secret – she does not fit design-wise in this story nor in any other FF property. This is a shame as she’s an interesting take on a Final Fantasy recurring character, and, outside of her ridiculous design, she’s portrayed as a formidable foe, with one incredibly cool panel where she performs a stunning ice spell to stop an incoming attack. Hopefully her look will become less distracting over the course of the story, but the character design really could have gone another few rounds of re-design to make her more than just her ‘assets’. The story of Final Fantasy: Lost Stranger continues at a gradual yet fun pace, with plenty of FF franchise references for fans to lap up, whilst also providing engaging battle scenes and story developments. A few artistic choices bring this volume down a touch but the way the story is progressing so far is intriguing, so be sure to check it out. 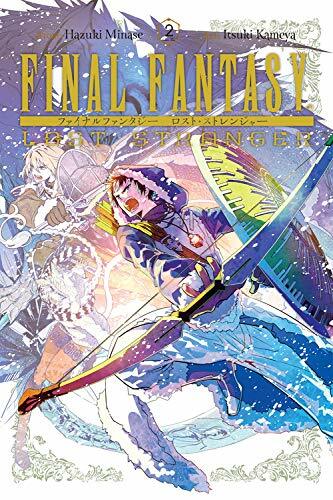 Final Fantasy: Lost Stranger could have been a recipe for generic isekai fodder but thankfully it’s been written and drawn by long-term Final Fantasy fans and their love for the franchise shines through.